Do you think we’ll ever find life on other planets? This month, an 816-pound spacecraft is scheduled to collide with Tempel 1, a comet 83 million miles away, which scientists hope will shed light on the formation of the solar system. Last January, a probe landed on Saturn's largest moon to explore its intriguing atmosphere and terrain. Through pictures sent back to Earth, the martian rovers, Opportunity and Spirit, have much to tell of their year-and-a-half-long journey across the red planet. New-generation telescopes and observing platforms are getting off Earth to find other Earth-like planets. Artificially endowing beaches with sand is an expensive and arduous task that can fail easily if geology is not taken into account. Both gorillas and the forests where they live are endangered, leading conservationists to look to satellites for land-use monitoring. From comet and bird-watching to weather observations, average people are helping scientists in measurable ways. Peaking of World Oil Production: Is the Wolf Near? Determining when the worlds oil is going to peak poses a unique challenge to petroleum geologists, economists and policy-makers, but the time to act is now. The Energy Bill: Is It Big and Broad Enough? The U.S. House of Representatives has finally passed an energy bill, but the effort to shape national energy policy is far from over. The founding of the Bank of America is intimately linked to the 1906 San Francisco earthquake. 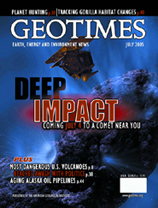 Visit the Geotimes archives to search for past news and views. 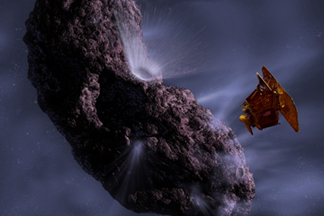 On July 4, the Deep Impact spacecraft will ram into comet Tempel 1. The aim of the mission is to give scientists a view of crater formation on the comet, while examining the materials that compose the icy body, which they believe represent the composition of the early solar system. Image courtesy NASA/JPL/UMD and adapted from original. Read the story here.